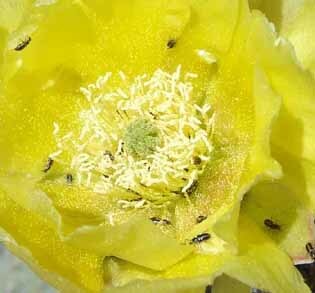 Common or abundant throughout Arizona and beyond (and ranging from 1,500 to 5,000 feet), this is a very robust form. Its stems range from almost circular to rhomboid in shape (and up to more than a foot across), and some mature plants attain heights of nearly 9 feet, often forming a sort of round-topped cone in overall shape. 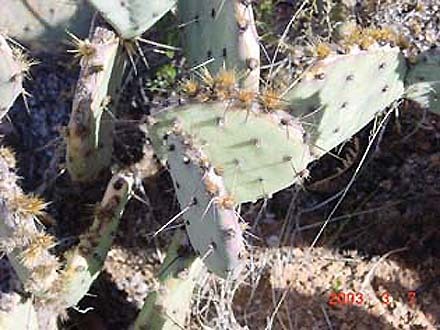 The stems are green to bluish green in color, spines are gray to white and up to 3" long. Areoles have brown to yellowish glochids. 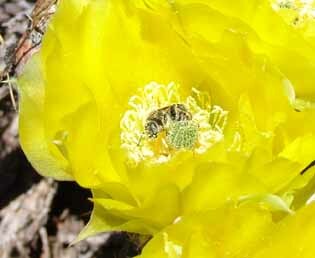 Flowers, blooming from April to June, form along the edges of pads, are yellow to orange in color, yielding red to purple cylindrical fruit up to 3" long. In the photo below left, you see some of the rhomboid forms as well as the overall shape of the whole plant, which is much taller than O. phaeacantha. 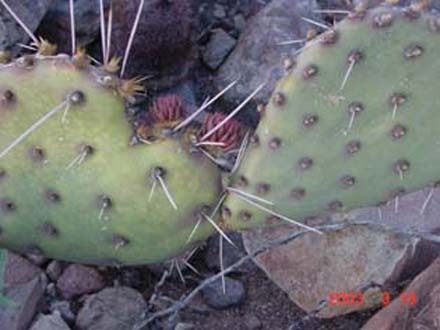 Below right, you see an edge less thick with reddish-brown glochids and also a pad whose overall color is a paler blue-green, with hardly a hint of purple or red. 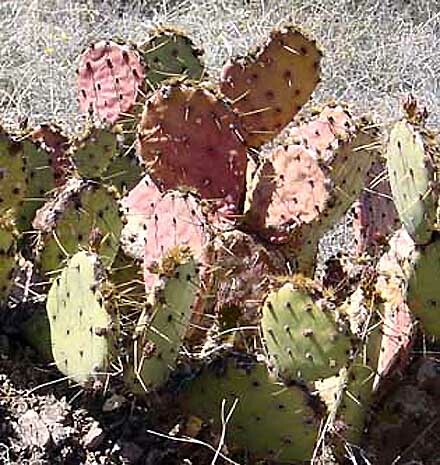 In this type of Prickly Pear, you see, below left, a much lower-running plant overall, and a thicker array of reddish-brown glochids along the edges. Note also the hints of purplish color along the edges, contrasting with the green. Below right, this purplish color is evident not only along the edges but around the rims of the areoles. Note also in this picture the reddish new ephemeral leaves appearing with the buds. Photos were taken in March of 2003. 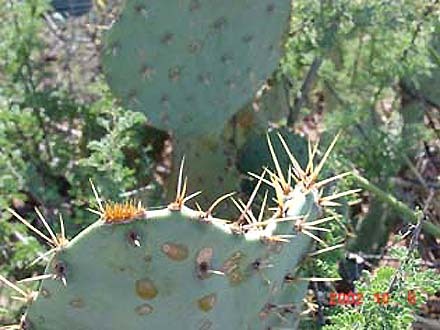 For an apparently similar contrast drawn between these two types of Prickly Pear, see the following link to Mineral Arts -- where the Phaeacantha variety is labeled as "Brownspine Prickly Pear". 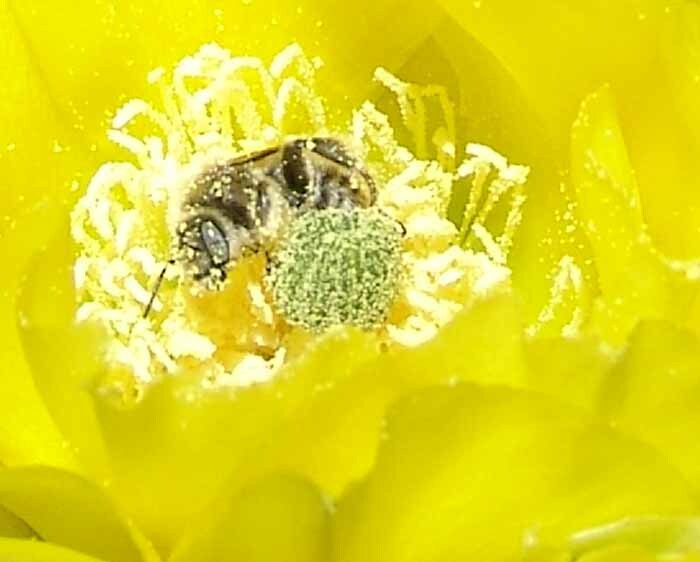 Both types are visited by a wide array of pollinators, diverse beetles, solitary bees, and european honeybees. In the image below left, a solitary bee wallows alone; below right, numerous tiny beetles are busy. Both types ripen into fleshy fruits that are edible and sweet-tasting (but which contain glochids in the rind). Humans use the juice to make jellies. 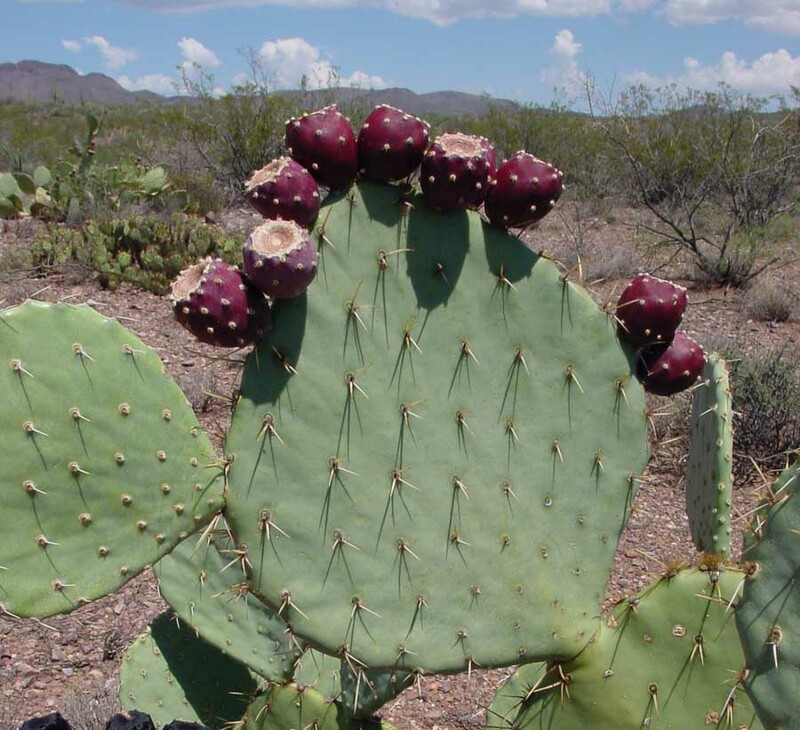 For more details on Prickly Pear harvesting and processing, see this link: Daniel Baker's Wildfoods Logbook. 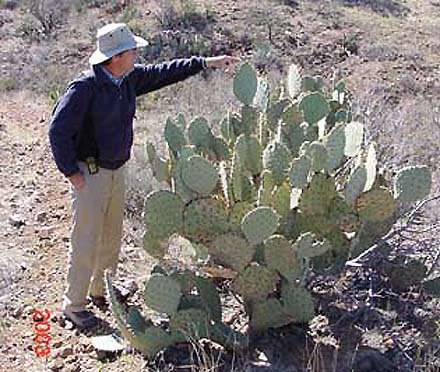 Mark Dimmit (p.218 in Phillips & Comus, cited on the main Cacti page) observes that the Engelmannii fruits, called "tunas" -- which ripen in tremendous abundance and persist on the plants for months -- are both far too numerous and many stand too high and remote from the ground for the small creatures of our Sonoran Desert to consume most of the fruits. 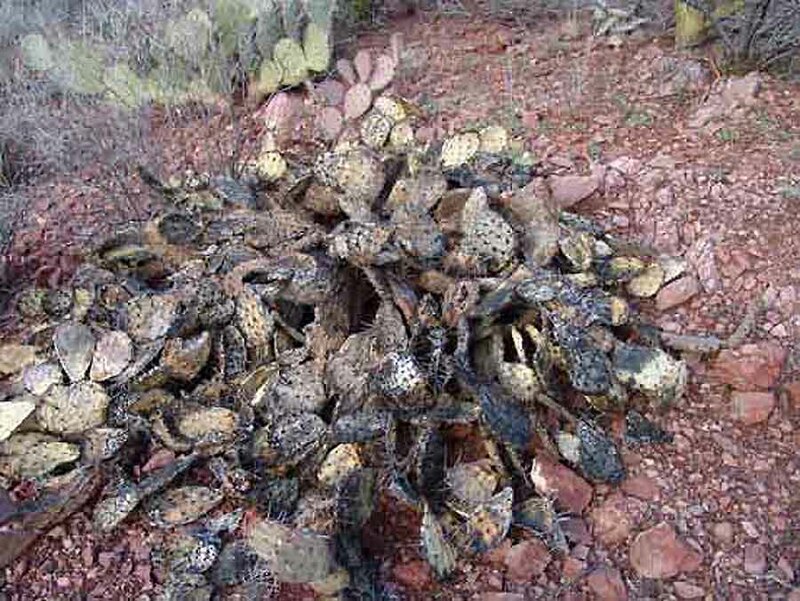 This poses an evolutionary-ecological problem: why such a waste of bio-energy in overproduction of fruits, most of which eventually decay and shrivel uneaten? 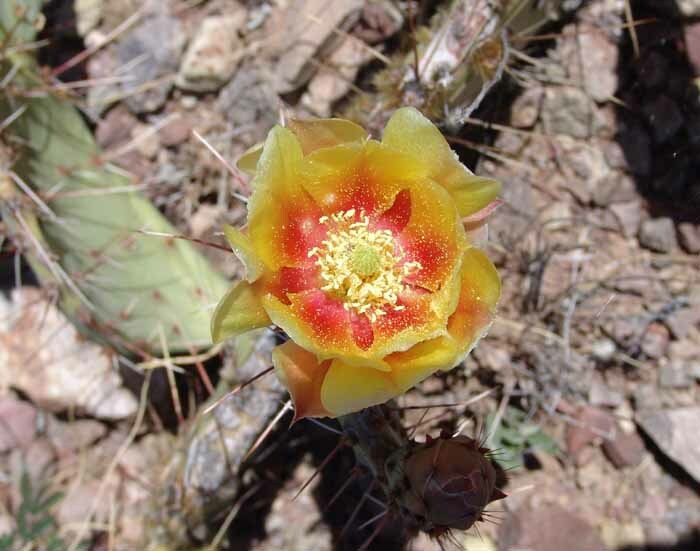 Dimmit suggests it seems likely that Opuntia engelmannii Prickly Pears coevolved with the now-extinct Megafauna of the Pleistocene Southwest, which could consume this highly nutritious crop and act as efficient agents of seed dispersal. 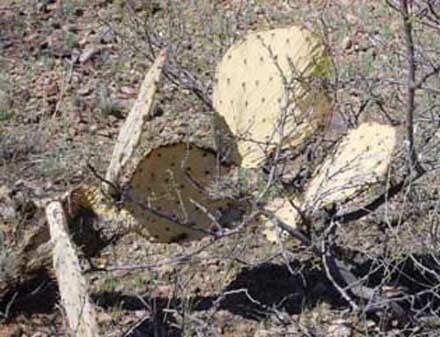 Their extinction left the Engelmann Opuntia fruits standing "high and dry", so to speak. In the recent past, of course, cattle -- and also horses -- have arrived to play this role, as is evident in the great proliferation of O. engelmannii in many of our desert uplands today. 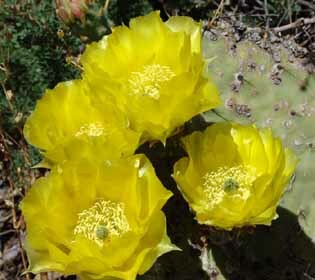 Below: Opuntia engelmannii fruit ripening. The fruit of O. phaeacantha are much smaller. 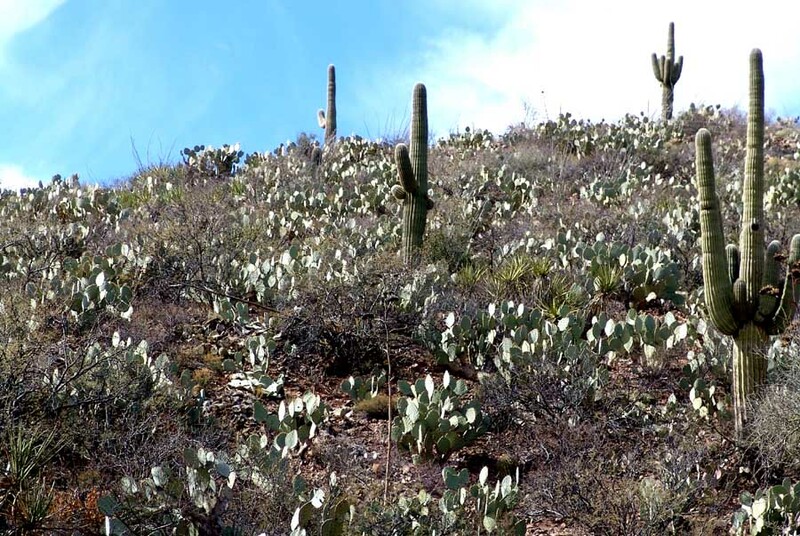 This hillside is directly northeast of Sierra Blanca, and is fairly typical of this area.